Product #18292 | SKU XL50-S3036 | 0.0 (no ratings yet) Thanks for your rating! 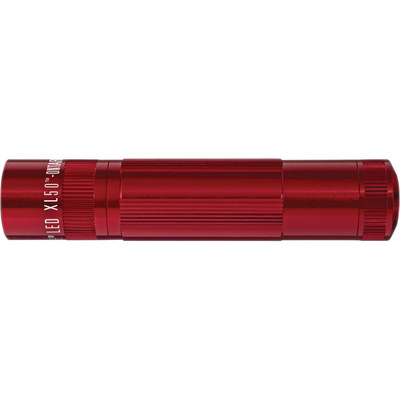 The Maglite XL50 LED Flashlight (Red) is a sturdy pocket flashlight that uses MAG-LED technology for high brightness and low power consumption. This flashlight offers three settings, accessible via a single pushbutton on the bottom of the flashlight. One click turns on the flashlight, two clicks switches to 25% power mode, three clicks activates the emergency safety strobe. A twist top makes it easy to adjust the LED beam from spot to flood. Power is supplied via three included AAA batteries which last for 6.5 hr in high mode and 33 hr in energy saving mode. This light is designed for durability with a machined aluminum case and a corrosion resistant anodized finish.